Tree 72. Manu MacTaggart (8-years-old / 16-years-old). I had the joy of meeting and recording a conversation with Manu in a tree eight years ago. 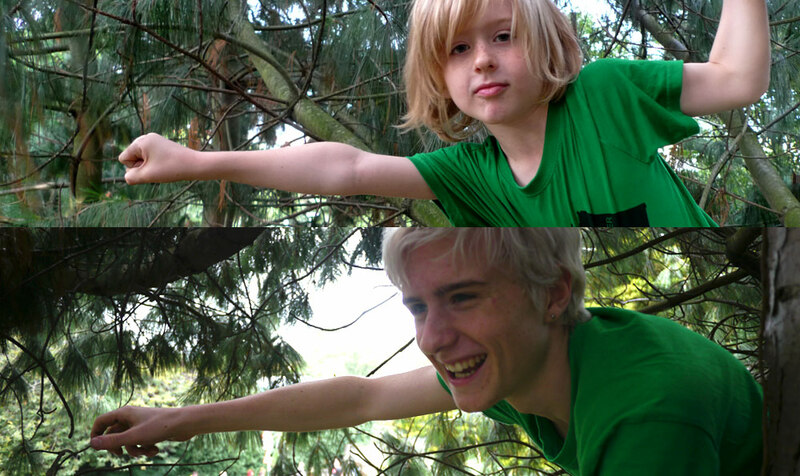 The other week, eight years later we climbed the same tree and listened back to our recorded conversation. Manu said he found it hard to identify with his old self – the old Manu was a bit alien to him. Funny thing is, the first tree we re-climbed was the wrong one. We thought it had changed that much in eight years. We were surprised by how much more cramped it was to climb and it somehow felt wrong. Limbs had been lost from both trees through wear and tear and the ravages of Council tree surgeons however… Perhaps trees are like people – their personality stays more or less the same under the veneer or becoming wiser / more ignorant / angry / loving. When I noticed ‘our tree’ from eight years ago, it was obvious. I was going to include Manu’s eight year old ideas for a tree design, but I think this entry will now be about how we perceive change… or maybe both, maybe. Aware of Dark Mountain? If not I highly recommend reading their manifesto. Dark Mountain has been running a series on trees this month and I was asked to produce a few entries for it. My offering can now be read on their blog like a sneak preview of what I’ve been up to – woaah.